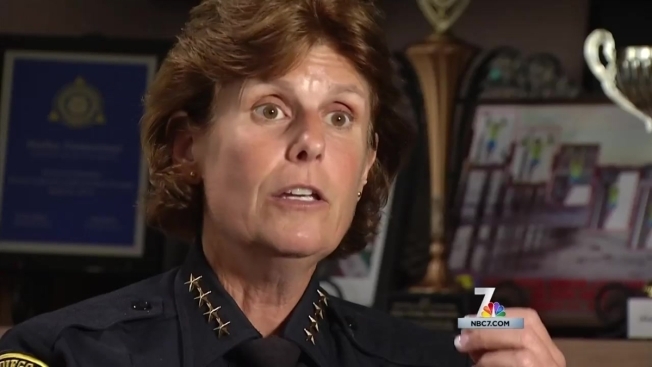 Chief Shelley Zimmerman has fired 11 San Diego Police Department officers in a single year, more than the former chief did in three years combined, according to new numbers released by SDPD. NBC 7 Investigates asked for the details of those firings, but our request was denied because, according to a department spokesperson, that information can't be released to the public due to statutory exemptions under the California Public Records Act. "We have a culture of excellence in our police department and we're holding all of our personnel accountable,” Zimmerman said. Under Zimmerman’s watch, at least 11 officers were fired or resigned before being terminated from July 1, 2014, to June 30, 2015. That compares to a total of nine officers during the last three years former Chief William Lansdowne was in charge. NBC 7 Investigates reached out to Lansdowne for reaction, but we have not heard back from him. Zimmerman used a sports analogy to explain why some officers are not given a second chance when they break the law or violate department policy. "If the quarterback goes out and willfully throws that ball, intentionally throws that ball to the other team, to hurt our team, then you don't play for me. You don't work for me," Zimmerman said. Zimmerman said her decision to reinstate the department’s Professional Standards Unit is the main reason for the increased number of firings. The unit investigates citizen complaints and internal tips about possible officer misconduct. It was previously disbanded by Lansdowne under budget pressure. "So, as soon as a piece of information comes in, they are able to immediately react to that,” Zimmerman said. “I think that is the biggest difference, that this is their full-time job and they can immediately react to it." Through the state open records act, NBC 7 Investigates submitted a request for the names of the 11 officers and information about why they were fired. The request was denied because the department argues the information is confidential, personnel information. "I'm not going to get into the specifics as to what each of them had done," Zimmerman told NBC 7 Investigates. But the chief said she would release information about the reasons for the firings, if state law and the Public Records Act allowed her to do so. Donna Frye, a former San Diego city councilwoman and open-government advocate, said the chief has the discretion to at least reveal why the officers were fired without naming them. "I do not believe that that violates any state law,” Frye said. “And I believe that the public interest outweighs the privacy interests, especially if some of those behaviors may have involved members of the public and the public has a right to know that." One of them was a 27 year veteran. Another served the department for 24 years. A third officer had been with the department 10 months when he (or she) was fired. Those statistics also reveal Chief Zimmerman fired five officers in a less than two month span, from May 8th to June 30th.